The trend toward "active learning" may overthrow the style of teaching that has ruled universities for 600 years. Eric Mazur says learning interests him far more than teaching, and he encourages a shift from "teaching" to "helping students learn." ...and a laptop at the front of the classroom tallies students’ responses. 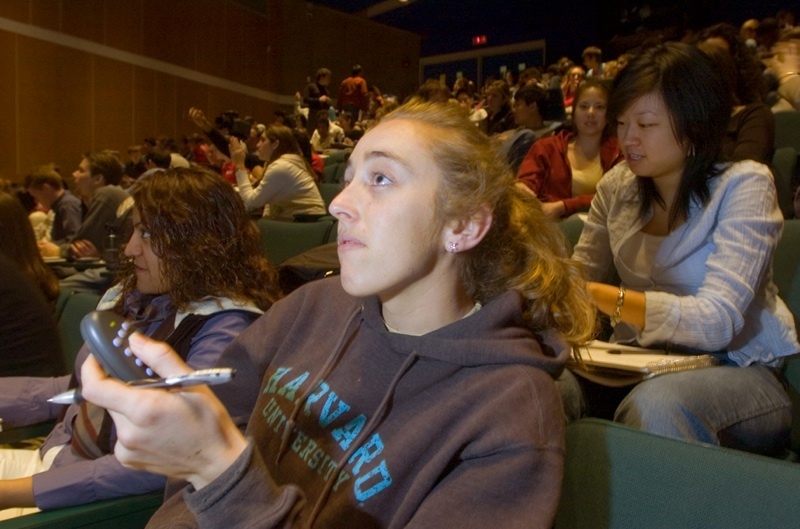 Examples of active learning abound in the Harvard curriculum. View video clips of Mazur and other faculty members demonstrating and discussing innovative teaching. Read about a February 3 symposium that highlighted the science of learning and examples of innovative teaching. Interactive learning triples students’ gains in knowledge as measured by the kinds of conceptual tests that had once deflated Mazur’s spirits, and by many other assessments as well. It has other salutary effects, like erasing the gender gap between male and female undergraduates. 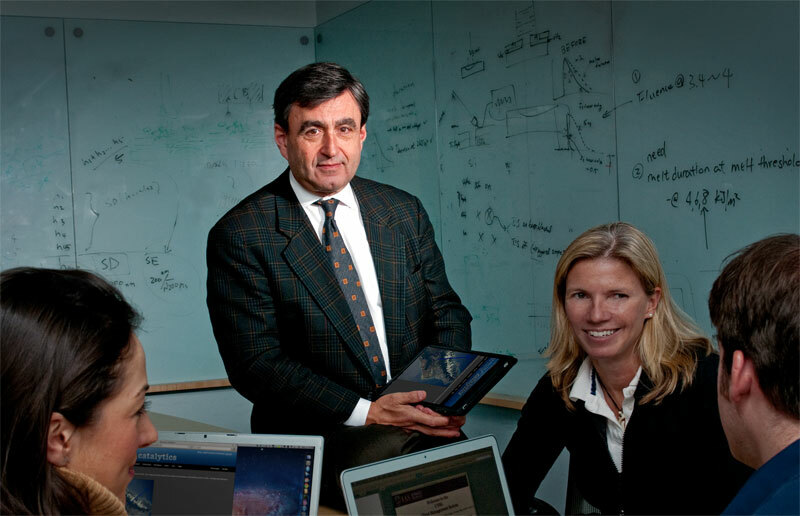 “If you look at incoming scores for our male and female physics students at Harvard, there’s a gap,” Mazur explains. “If you teach a traditional course, the gap just translates up: men gain, women gain, but the gap remains the same. If you teach interactively, both gain more, but the women gain disproportionately more and close the gap.” Though there isn’t yet definitive research on what causes this, Mazur speculates that the verbal and collaborative/collegial nature of peer interactions may enhance the learning environment for women students. There’s also better retention of knowledge. “In a traditional physics course, two months after taking the final exam, people are back to where they were before taking the course,” Mazur notes. “It’s shocking.” (Concentrators are an exception to this, as subsequent courses reinforce their knowledge base.) Peer-instructed students who’ve actively argued for and explained their understanding of scientific concepts hold onto their knowledge longer. Another benefit is cultivating more scientists. A comparison of intended and actual concentrators in STEM (science, technology, engineering, mathematics) fields indicates that those taught interactively are only half as likely to change to a non-STEM discipline as students in traditional courses. Scores of Harvard faculty members are experimenting with innovative styles of teaching in their classes. Mazur’s profile is perhaps the highest because he has been at it for two decades and has poured so much passion into the pursuit. But across the University’s faculties, instructors are trying out new, more effective modes of pedagogy, partly in response to a generation of students who have been learning all their lives from computer screens, websites, and visual media (see “Professor Video,” November-December 2009, page 34). Often, these efforts embody a search for alternatives to the traditional lecture. The recent $40-million gift from Rita E. Hauser, L ’58, and Gustave M. Hauser, J.D. ’53, will spur a wide variety of experiments in this realm (see “A Landmark Gift for Learning”). Such pedagogical invention isn’t just a trial-and-error endeavor. Rigorous evaluations using statistical analysis can help distinguish the most promising innovations. For his part, Mazur has collected reams of data on his students’ results. (He says most scholars, even scientists, rely on anecdotal evidence instead.) End-of-semester course evaluations he dismisses as nothing more than “popularity contests” that ought to be abolished. “There is zero correlation between course evaluations and the amount learned,” he says. 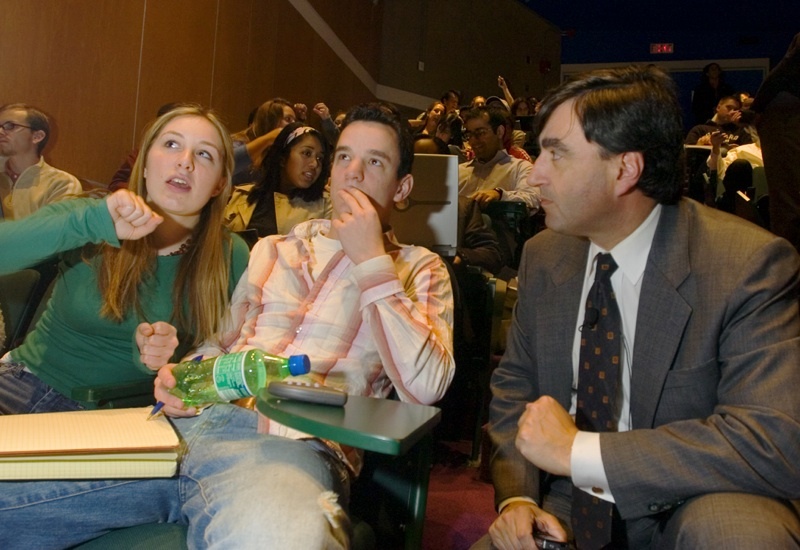 “Award-winning teachers with the highest evaluations can produce the same results as teachers who are getting fired.” He asserts that he is “far more interested in learning than teaching,” and envisions a shift from “teaching” to “helping students learn.” The focus moves away from the lectern and toward the physical and imaginative activity of each student in class. Active learners take new information and apply it, rather than merely taking note of it. Firsthand use of new material develops personal ownership. When subject matter connects directly with students’ experiences, projects, and goals, they care more about the material they seek to master. In the abstract, for example, statistics may seem a dry pursuit, but a graduate student with her own data to analyze for a doctoral dissertation suddenly finds multiple regression a compelling subject. Taking active learning seriously means revamping the entire teaching/learning enterprise—even turning it inside out or upside down. For example, active learning overthrows the “transfer of information” model of instruction, which casts the student as a dry sponge who passively absorbs facts and ideas from a teacher. This model has ruled higher education for 600 years, since the days of the medieval Schoolmen who, in their lectio mode, stood before a room reading a book aloud to the assembly—no questions permitted. The modern version is the lecture. Though it remains the dominant form of instruction in higher education and can sometimes become a real art form, the lecture may be on its last legs. “The hands-on interactive experience in a lab or an art studio is more powerful than a lecture, and can’t be replicated online,” says Logan McCarty, director of physical sciences education. “The stereotypical lecture where the professor is giving exposition of textbook-type material to the students—I think that type of exposition can be done better with online video or by an interactive-tutorial format.” Today at Harvard, many courses distribute lecture notes, and others post video recordings of lectures online. After hearing about Mazur’s approach to teaching, Weatherhead University Professor Gary King, a government scholar, started to make recorded lectures available before class, thus freeing class time for more active styles of instruction. At the same time, “More and more faculty are finding that the traditional lecture no longer suits them,” Aladjem notes. “And they are finding alternative ways to connect with students. Some are quite sophisticated in using course websites, blogs, and other means to be in touch. Michael McCormick, Goelet professor of medieval history [see “Who Killed the Men of England?”], holds office hours late at night via Skype, and it’s very popular. Nearly all undergraduates have laptops, smart phones, or other computing devices and use them all constantly. In this environment, we have to keep in mind that there’s some sort of quantum—a fixed amount—of human attention. In a digital age, we are dividing it up into ever-smaller slices, and there’s more and more a race to get pieces of that attention, especially in the classroom. That is one of the biggest challenges facing our faculty. 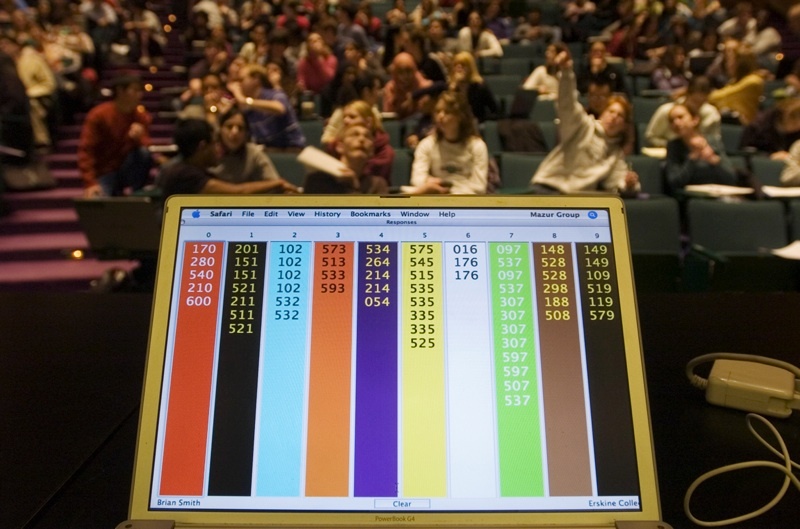 Thus Mazur begins a class with a student-sourced question, then asks students to think the problem through and commit to an answer, which each records using a handheld device (smartphones work fine), and which a central computer statistically compiles, without displaying the overall tally. If between 30 and 70 percent of the class gets the correct answer (Mazur seeks controversy), he moves on to peer instruction. Students find a neighbor with a different answer and make a case for their own response. Each tries to convince the other. During the ensuing chaos, Mazur circulates through the room, eavesdropping on the conversations. He listens especially to incorrect reasoning, so “I can re-sensitize myself to the difficulties beginning learners face.” After two or three minutes, the students vote again, and typically the percentage of correct answers dramatically improves. Then the cycle repeats. “We want to educate leaders, the innovators of society,” Mazur says. “Let’s turn our students into real problem solvers. In a real-world problem, you know where you want to get, but you don’t know how to get there. For example: how can I bake a cake with no flour? The goal is known, but the prescription to get there isn’t. Most tests and exams at Harvard are not like that; they are questions where you need to determine what the answer is. In physics it might be, What was the velocity of the car before it hit the tree? There, you know exactly what you need to do: you have a prescription to calculate velocity, but you don’t know the velocity. It’s the opposite of a real-life problem, because you know the prescription, but you don’t know the answer. “Even now, if I give my students a problem on an exam that they have not seen before, there will be complaints: ‘We’ve never done a problem of this kind.’ I tell them, ‘If you had done a problem of this kind, then by definition, this would not be a problem.’ We have to train people to tackle situations they have not encountered before. Most instructors avoid this like the plague, because the students dislike it. Even at Harvard, we tend to keep students in their comfort zone. The first step in developing those skills is stepping into unknown territory. Universities are at the core of an information culture: it is hard to imagine any institution that deals more purely in information than higher education. Yet academies are also famously slow to change—both a strength and a vulnerability in a rapidly evolving world. If knowledge now streams in from everywhere, if universities are no longer the “gatekeepers of information,” what essential mission can transcend such technological and cultural change? “The live classroom is still the best medium for a student to truly be known as an intellectual being and to engage with other such beings,” Aladjem says. “You learn from your peers in all walks of life. Students have always hidden in their rooms; social media can keep them in their rooms longer.” Perhaps the key is to coax students not only out of their rooms, but into each other’s minds. If learning is indeed a social experience, then a “party school”—of a certain kind—just might offer the richest learning environment of all.